The author has provided a fascinating insight into the command decisions made by Landsdorff and the fatal result for him and for his command. The author has benefited from the broad spread of topics on which he has previously written. This includes some insightful titles covering from the Medieval period to modern times. These books have been released by a number of publishers. Many naval historians not only concentrate on naval warfare, but on one brief period of naval history. The author’s breadth of experience has combined with thorough research and been supported by a selection of well-chosen images in a black and white plate section. The story starts with WWI commerce raiding to set out the perspective that influenced decisions on both sides. The Graf Spee is described and both shortcomings and advantages are identified. The Montevideo period is covered, and there is a description of the status of the vessel from the German damage review. This is a moving story of success and failure, of good decisions and poor decisions. A very valuable addition to our pool of knowledge of an important naval action. DESCRIPTION: A very interesting book that looks specifically at the command decisions during one of the most famous naval actions of World War Two. The Battle of the River Plate is one of those iconic naval actions that is familiar to people around the world, but which is also largely unknown in the detail. For many it is a classic David vs Goliath combat where three plucky small British cruisers brought a massive battleship to bay and saw it run off, tail between the legs, only to then commit suicide. That perception is not fair to either side in the battle and this book sets out the command decisions that resulted in the final result, viewed from the perspective of the German captain. The German and British navies were effectively on war station before the declaration of war. The Royal Navy had initiated what was described as a mobilization exercise that saw the recall of Reserves and the rapid mobilization of warships, including the early completion of refits and repairs. At the same time, fuel and other supplies were rushed to dispersed locations around the world to provide for the fuelling and storing of warships as they arrived on station. Having achieved what was effectively war status, the Admiralty maintained the Fleet at that level through into the shooting war. The Germans had begun moving freighters and surface warships to war positions, but on a much more modest scale with far fewer vessels to mobilize and without the network of friendly fuelling stations and supply bases available to the British. That meant that German commerce raiders had to carry maximum supplies and sail in conjunction with a re-supply vessel. Preparations for war on land and in the air in Britain were much less advanced, almost leisurely. Even after the formal declaration of war, most RAF missions were leaflet drops rather than bombing missions. The relatively short range of fighters meant that there were few opportunities for aerial combat and the first German aircraft to be shot down was victim of a Fleet Air Arm Skua that was officially a dive bomber but was also the most effective fighter then available to the FAA. The British Army achieved even lower levels of activity, although an important percentage of available troops was moved to France as the British Expeditionary Force and took most of the available artillery and armour with it. During this “Phoney War”, only the Royal Navy was immediately exposed to a shooting war, with the Merchant Navy most exposed on the long Empire sea routes. Even the recent experience in the 1914-1918 War of a handful of German commerce raiders creating problems beyond their numbers, the Royal Navy had made plans to deal with the new generation, but they were seriously hampered by the run-down of resources after 1918 and the long years of appeasement. The result was that many merchant vessels under the British flag were sailing independently and those in the South Atlantic and Indian Ocean were potentially vulnerable even to the smallest German commerce raiders. Treaty Tonnage was a major challenge to Britain because of the number of obsolescent warships in commission, occupying a large share of permitted Treaty Tonnage, but the Germans had also been exercised by tonnage limitations and decided to build three large armoured cruisers, each equipped with two triple turrets housing 11 inch guns, radar, a heavy secondary armament, and diesel engines rather than steam turbines. The layout and equipment of these vessels made them most suitable as heavy commerce raiders, able to outgun the destroyers and cruisers that they were likely to meet and with the longer range of the economical diesels. Their sailings were planned to leave Germany via Icelandic waters, together with supply ships, positioning them to interdict the British merchant shipping routes. It was considered that they were unlikely to meet British battleships, being the only vessels considered more powerfully gunned, and that the use of single warships on the vast areas of the southern oceans significantly reduced the probability of a major British capital ship finding them. The early stages of the war cruise of the Graf Spee supported these assumptions. Her captain took her across shipping lanes in the South Atlantic and the Indian Ocean, varying the activities and making changes to the ship’s appearance to confuse the enemy and encourage them to think that all three armoured cruisers were roaming the areas. The weakness of the plan was that a highly successful cruise would encourage the British to set up one or more Task Groups to locate the raider(s) and bring them to battle, probably sending battleships and aircraft carriers with the Task Force(s). That would then open the Graf Spee to its vulnerabilities, facing larger, more heavily armed ships and the attentions of torpedo planes and dive bombers, all faster than the economical diesel engines of the German warship. 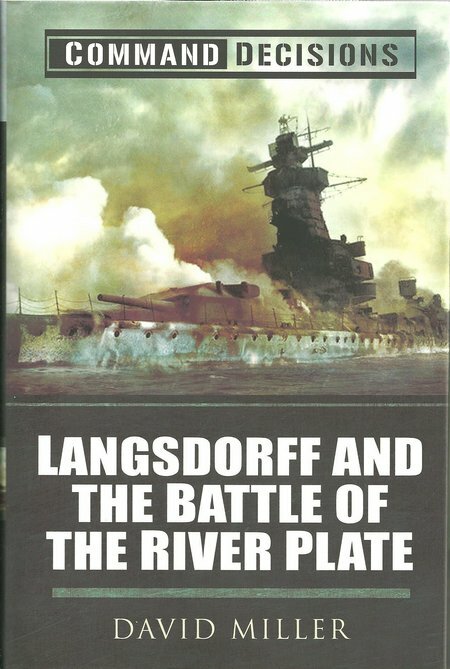 When the inevitable happened and the Graf Spee found itself facing three British warships, Captain Langsdorff had no less hesitation than the British commander in heading directly for the enemy. The Battle that followed was broken off only when the Graf Spee ran for cover in the neutral harbour of Montivideo, Uruguay. Once in a neutral port, the Graf Spee was subjected to intensive diplomatic activity and instruction from Hitler than the ship was not to fall into British hands. The British worked a brilliant propaganda campaign that convinced the Germans of an overwhelming RN force approaching the Uruguayan territorial waters. Believing that the British had trapped the Graf Spee, the Germans had only the two choices of internment or self-destruction. Surrender to the British was not an option, destruction at sea was little better, and even internment would be a propaganda disaster at a stage in the war where Hitler still hoped to bully France and Britain into an armistice. In the event, the scuttling of the Graf Spee gave Britain a much-needed early naval success. Over the years there have been books and films looking into many aspects of the Battle of the River Plate but detailed examination of command decisions has been strangely muted. Technically, the Graf Spee should have sunk or disabled all three cruisers facing her. She was equipped both with radar and two catapult-launched seaplanes. That should have allowed her to out manoeuvre the RN vessels and disappear into the ocean. If escape was considered not to be an option, the Graf Spee should have been able to outgun the three much smaller and less powerful enemy ships. The two smallest vessels carried an armament little stronger than that of a large destroyer. The largest vessel, HMS Exeter, was a heavy cruiser with 8 inch guns, but these were much less potent than the radar and 11 inch guns of the pocket battleship. Given the relative strengths and weaknesses, the Graf Spee was only going to be defeated by a lucky few shots, or a number of flawed decisions by her Captain and officers. When battle was joined, the British had few options open. They had to close the range rapidly to reduce the Spee’s range advantage, and they had to try to divide the enemy fire, a pack of dogs attacking an elephant. The British commander decided to launch a Seafox spotter plane to give the best assistance to the gunnery control on the three British cruisers. With the Exeter heavily damaged, the Graf Spee turned away at a critical point and then ran for cover. Once in port, repairs could be carried out, but all surprise had been lost, the British knew exactly where the Spee was and could position intelligence officers in a vantage point ashore to monitor all German activity. In concert with Allies, the British could delay the Spee’s sailing by invoking the Neutrality rules and Uruguayan sympathy to ensure that merchant ships were sailing in relays to keep the Spee in harbour to honour the 8 hour rule. The Seafox continued to be flown, providing a visible reminder of nearby British warships. Some have claimed that this influenced German decisions because they believed that several Seafoxes were being flown from several large British warships just over the horizon. Given the unreliable Ar196 seaplanes that equipped the Spee, there was a reluctance to believe the British Seafox biplane achieved far higher reliability. As a number of documents failed to survive the war, we may never know all of the details relating to what became the Intelligence Battle of Montevideo, a battle fought clandestinely but as dangerous as a clash of warships at sea. Certainly, the Exeter had withdrawn to the Falkland Islands for emergency repairs, to be replaced by the cruiser Cumberland, but the Admiralty was already sending heavy units with air support to the Uruguayan coast. That left a narrow window for the Spee to attempt a break out and this opportunity was missed. We can only speculate on the possible success of an early breakout, but the Spee’s supply ship did manage to escape all British attempts to stop her, until she reached Norwegian waters where a daring British destroyer attack resulted in the release of all prisoners being held on the Altmark. The Spee would have faced higher odds because of her value and size, probably seeing her captured or sunk in South American waters. Unlike the Altmark, the Spee had to put back to sea under the observation of the enemy. That would almost certainly have enabled the RN to intercept her with heavy units and naval aviation.